Angel Pavement on Radio 4 this weekend! J.B. Priestley’s great novel of the City of London and the working lives of Londoners during the Depression, Angel Pavement, will be broadcast on Radio 4 on Sunday 5 May 2013 at 3 pm. Part 2 will be broadcast on Sunday 12. I expect it will be available to listen online for some time after the broadcasts. Posted in Literature, Priestley, J.B.
One of J.B. Priestley’s finest novels is back in print again! J.B. Priestley’s talent for evoking the atmosphere of a city is never better shown than in Angel Pavement, his follow-up to the huge success of The Good Companions. He brings 1930s London to life for us. The novel also shows Priestley’s deep understanding of human nature and organisations and his concern about unfettered capitalism, as he explores the effects of the predatory Mr Golspie on the staff of the struggling veneers company Twigg and Dersingham. Great Northern Books, who have already reprinted many essential Priestley works, now make this superb novel available in print again. Find out more on the J.B. Priestley Society website. This broadcast followed on from the 8 September Postscript, in which Priestley tried to inspire those facing the Blitz. Priestley paid tribute to London, where he had lived or spent a great deal of time since the early 1920s. 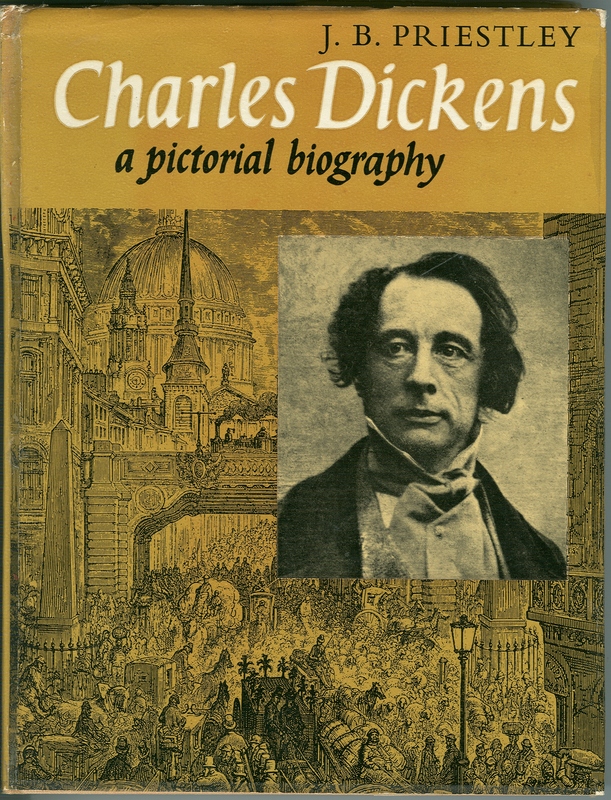 He had believed that the “true cockney spirit, independence, ironic humour, cheek and charm” he admired in the works of Charles Dickens were gone, disliking the “vast, colourless” suburbs and the shocking extremes of wealth and poverty seen in the West End. He was pleased to have been proved wrong. Seeing “fires like open wounds” caused by the bombing, Priestley realised he loved the city. He contrasted Paris, which had fallen, its people deceived and betrayed, with London, which was continuing to stand for freedom. Posted in Priestley's Finest Hour, Priestley, J.B. This broadcast tried to comfort and inspire listeners facing the terrible bombing raids on London and other cities. 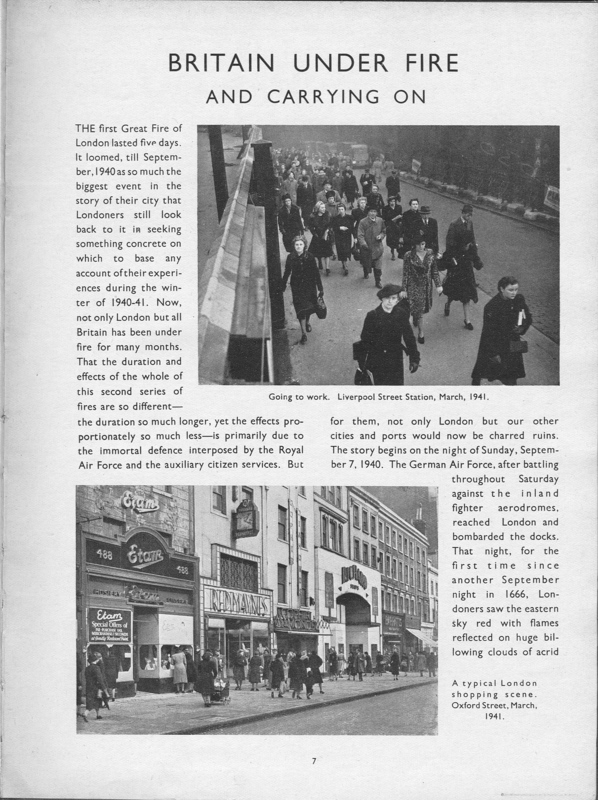 Intense bombing of London had started the previous day and was to continue throughout the winter. At least in this war, civilians were sharing the danger – in a sense, there were no civilians now. In the First World War, civilians had had to wait helplessly at home for news while “whole towns in the North – my own amongst them – lost at a stroke the fine flower of their young manhood”. Priestley’s childhood friends, in the Bradford Pals, died in one battle, the Somme. He felt that “we are much better off now. At least we are sharing such danger as there is”. He admired how people had risen to the challenge, carrying on with their lives in the middle of a battlefield, with the world’s attention on them, and was proud to describe this in his overseas broadcasts. The image is from Britain under Fire, a Country Life publication, containing over 200 photographs of the damage done to Britain’s historic buildings by the bombers in the winter of 1940-1941. The typography and design of this book is typically 1940s, resembling the Ministry of Information “Keep Calm and Carry On” poster which has seen a recent surge of popularity. The book encapsulates this message: people are seen going about their daily lives amonst the rubble. Priestley wrote the foreword, emphasising to overseas readers that Britain was not in ruins – everyday life was going on – but the damage had been terrible: “Let the camera tell its twofold story, of a great crime, and of a still greater people”. J.B. Priestley’s Postscript broadcast on the “last Sunday of the first year of the War” is a difficult one to paraphrase because it is pure atmosphere. Priestley took a day all his listeners would remember, the first day of the War, and reflected on how strange it had been and how he had felt. No doubt many listeners had seen similar sights, experienced similar feelings: one of Priestley’s great literary skills was articulating such shared experiences. He had travelled from his Isle of Wight home to London to broadcast the first installment of his new novel, Let the People Sing. It was a day of fear and contrasts, everywhere far busier or far quieter than usual. Sirens going off in Staines, the “long vacant roads of Kentish Town and Camden Town, as empty of life as the old cities of the plague”, Broadcasting House (home of the BBC) felt like a First World War headquarters. Paddington railway station “looked as if it had had six consecutive Bank Holidays”, “reeked of weary humanity, thick with wastepaper, half eaten buns and empty bottles”. Looking out of the train window on the way home, Priestley saw a dragon-shaped cloud against the sunset sky, a magnificent sight. Did anyone else remember that? Priestley mused that he could not have foreseen what was to happen in the War, but he had expected the British people would rise to the challenge, and he believed they had: “Talk about giving courage and confidence – you’ve given me more than I could ever give you: not only courage and confidence in the outcome of this war, but also faith in what we can achieve after this war”. A unique and fascinating glimpse at the personalities involved in 1930s politics, pacifism and the arts will be on show at Gallery II at the University of Bradford from 6 March – 3 April 2009. The exhibition, curated by Alison Cullingford, shows pencil drawings made by Peggy Smith while she was working freelance for newspapers in the 1930s. Peggy Smith was a dedicated peace campaigner, who worked for the League of Nations Union in the 1920s, was one of the first women to sign the Peace Pledge in 1936, and sold Peace News on the steps of St. Martin-in-the-Fields for many years, as seen in this image. The exhibition will be the first time most of these original sketches have been shown in public. The sketches are held by the Commonweal Library and are cared for by Special Collections at Bradford. Like Brushes with Peace, which we blogged about last year, the show highlights the rich heritage of peace art at the University and at Bradford’s Peace Museum.